Even in a perfectly competitive world where people could move easily from one occupation to another,substantial wage differentials would appear. These differences would be necessary to reflect differences in the costs of education and training or in the attractiveness of certain occupations or to indicate rewards for’ unique talents. But even after taking into account all these reasons for wage differentials, we still find a large disparity in wage rates. The major reason for the remaining ,difference is that labor. markets are segmented into noncompeting groups. A moment’s thought will suggest that, instead of being a single factor of production, labor is many different, but closely related, factors of production. Doctors and economists, for example, are noncompeting groups because it is difficult and costly for a member of one profession to enter into the other. Just as there are many different kinds of houses, each commanding a different price, so are there many different occupations and skills that compete only in a general way. Once we recognize the existence of many different submarkets of the labor market, we can see why wages may differ greatly among groups. Why is the labor market divided into so many noncompeting groups? The major reason is. that, for professions and skilled trades, it takes’ a large investment of time and money to become proficient. If coal mining declines because of environmental- restrictions, the miners can hardly hope to larid jobs teaching environmental economics overnight. Once people specialize in a particular occupation, they become part of a particular labor submarket. They are thereby subject to the supply and demand for that skill and will find that their wn labor earnings rise and fall depending upon, events in that occupation and industry. Because of , this segmentation, the wages for ‘one occupation can diverge substantially from tIle wages in other areas. The job choice of new immigrants isa classic case of noncompeting groups. Rather than just answering random classified ads, new immigrants from a particular country tend to cluster in certain occupations. For example, in many cities, such as Los Angeles and New York, a large number of grocery stores tend to be owned by Koreans. The reason is that the Koreans can get advice and support (rom friends and relatives who also own grocery stores. As immigrants get more experience and- ducation in the United States and become more fluent in English, their job choice widens and they become part of the overall labor supply. 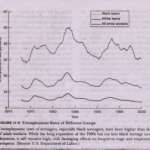 , ‘ In addition, the theory of noncompeting groups ,helps us understand labor market discrimination. We will,see in the next section of this chapter that much discrimination arises because workers are separated by gender, race, or other personal characteristics into noncompeting groups as a result of custom, law, or prejudice. ‘ ” While the theory of ‘noncompeting groups highlights an important aspect oflabor markets, we must recognize that in the longer run entry and exit will reduce differentials. 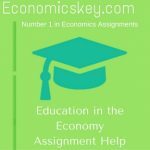 It is true that copper miners are unlikely to become, computer programmers when computers and fiber optics displace rotary dials and copper wires, Consequently, we may see wage differentials arise between the two kinds of labor. But in the longer run, as more young ‘people study computer science rather than go to work in’ copper mines, competition will tend to reduce some ‘of the differentials of these noncompeting groups. Table 13-4 summarizes the different forces at work in determining wage rates in competitive conditions.